Dentistry in the Digital Age – Dr. Brian Williams, D.D.S., F.A.G.D. As I discussed in my last Blog, Digital Dentistry has improved the quality and efficiency of Dental procedures. I would like to talk about Digital Impressions, Laser Cavity Detection and 3D Digital X-rays. 3D Digital X-rays are known as Cone Beam Computed Tomography (CBCT). These are 3 dimensional images of the jaw and facial structures offering a 3 dimensional view of the facial regions. This allows better treatment planning for dental implants and jaw surgeries. Nerves and other crucial structures are avoided during surgery. This allows for more accurate and safe placement of the dental implants. 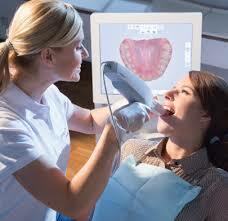 Digital Dental Impression with a small camera is some of the latest technology out. Studies have proven that it provides a more accurate impression than the standard mouth impressions. The size of the camera head has become smaller and much more comfortable for the patients. 3D Printers fabricate very accurate dental casts of the impression and crowns, bridges, and partial dentures are then fabricated on these models. This is a more accurate method than conventional and chairside milled crowns. The day is coming when the dentist can do the crown prep and digital impression and later in the day the lab will have the crown completed for cementation. More convenience, less time involved, and better accuracy in fit, all benefits to the patient. Laser and Light Cavity Detection devices are available now to detect surface cavities at a very early stage. These are cavities that are not detectable by X-ray. The devices measure fluorescence created by active bacteria responsible for active decay. In the minuet pits and fissures on the top of the back teeth, bacteria live and produce decay over the years. These devices now allow the dentist to detect when decay first starts. This allows painless removal of the decay without a shot and a smaller filling. Times are exciting in the dental world. I am excited and enjoy the fact that I can make a difference in patient’s dental experience and quality of care.